Discover India: EXCERCISE WITHOUT EQUIPMENT?? INDIA ANSWERS! EXCERCISE WITHOUT EQUIPMENT?? INDIA ANSWERS! Want to become thin without diets? Want to look beautiful and fresh all day long? Want to improve your memory power, concentration and intelligence? Will you not be impressed if I tell you a secret that is a 3-in-1 to do all the above, to achieve all this without feeling over-exhausted, without needing to spend a lot out of your purse? Well, there is! But, it's not a secret at all! You already know about it but most of you aren't just applying it. Some of you guys might feel I'm too boring if you know I was talking about yoga. But seriously, it is the most effective set of exercises- trust me... It's not just what researchers have proved, in my own experience yoga is a very good exercise that, unlike other physical fitness programmes that tires us, actually gives peace and relaxation to both our body and mind. Warm-up exercises: These are small warm-ups to start with. · Stand straight and look front. 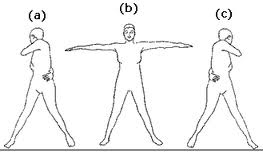 · Slowly lift both your hands sideways, as given in the picture, and turn your body, till your hip from side-to-side. · Repeat this as many times as you are comfortable. This exercise helps to let the body sweat, and brings the tension out, giving you a fresh feel to continue with your exercise. If you do this regularly, this would also help you to reduce the fat in your belly. · Interlock the fingers of your hands and place it on your chest. · Take a slow and long breadth in as you turn the inter - locked hands towards the front and stretch them before you, as if you are pushing something. · Breathe out slowly as you bring your hands back to the chest. This exercise helps you to slow down your breathing process and makes you body and mind calm and peaceful. · Stand straight. Stretch both your hands up. · Bend down and touch the ground. This exercise helps to bring out the fat in your tummy. · Stand straight. Place both your hands on your hip. · Look up and bend backwards. · Stand straight. Stretch both hands up. · Look up and slowly bend backwards and touch the ground. NOTE: 1. Don't try to touch the ground if you are unable to reach it comfortably. If you keep practising the exercise regularly, then you would see your progress...2. Touch the ground as near to your feet as possible, for very effective results. 3. 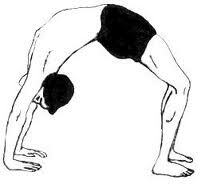 For relaxing your back, repeat this exercise alternately with forward bending. · Come back to normal position. Repeat this as many times as you are comfortable. This exercise helps to bring out the fat in your tummy and also your thighs. It makes your body flexible. · Stand straight. 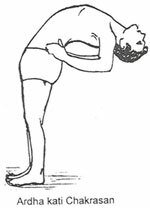 Lift your right hand sideways, shoulder level. · Turn your palm so that it faces upward. · Slowly lift your hand up and bend towards your left, letting your arm bend along with you towards the left side, touching your ear. · Slowly come back to the normal position. This exercise helps to keep your waist in proper shape and make your body flexible.